I always have high hopes for October. I mean… it’s Halloween. Could there be a better holiday to celebrate with paper dolls? Any yet despite my idea that I’m really going to be festive, I hardly ever am. I think I’ve done one Marisole Halloween set (which I didn’t feel like digging around the archives for). I remember fondly Liana’s wonderful Octobers with fantastic costumes and I always think I’m going to do something like that. Clearly, once again, that didn’t happen. 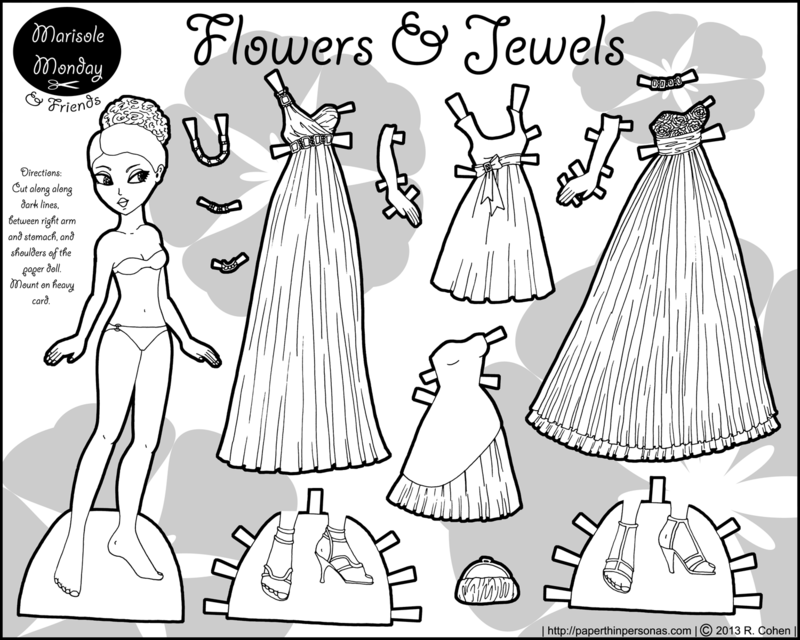 But hey… here’s some pretty prom dresses/evening wear and it’ll be in color next week. I could say I planned on using halloween colors… but I don’t. I plan on using a lot of teal and maybe some purple. I love these formal gowns. Your formal sets are some of my total favorites. I think the dress on the left is really pretty. Thank you, Jessie. I like doing formal sets as well and this is homecoming season, after all.